I have been a longtime supporter of CKUA, Alberta's priceless listener supported radio station. I became an ongoing donor back when Chris Allen was still working there, before he retired, as he had helped with a number of interPLAY festivals and I wanted to return the favour. Through many summers, winters, springs and falls, that small amount has been charged to my VISA. I rarely even notice it anymore. The truth is that CKUA and I had grown apart. As I started reviewing the things I contributed to it struck me that it might be time to make that call to stop payments. This is not the fault of the radio station, as they keep broadcasting and attempting to engage and/or capture my attention with emails. My inclination to disconnect was my fault alone. Despite my guilt, I spent about two minutes one day trying to find the cleanest and easiest way to cancel my support. I got distracted and let it go. I'm glad I did. My realization is that I can't listen to CKUA in short spurts. In other words, it is not my 'go to' station when I am driving from one end of Franklin Avenue to the other. I'm more likely to snap on CBC or one of our local stations. In that short five minute jaunt, I might catch some interesting talk or information. 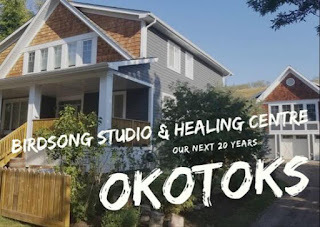 I have rediscovered the richness and beauty of CKUA while painting out in my shop the last couple of weeks. People may shake their head and wonder about my output of portraits in recent days, but the fact is that I have found a great way to relax in my off-time that just happens to be with a brush in hand. CKUA is my new and constant companion as I go through my evolving process of creating unique portraits of people. 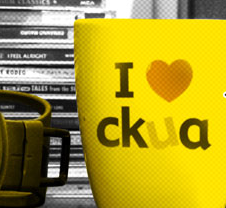 To get the full value and flavour of CKUA, it almost demands listening to it in big chunks. 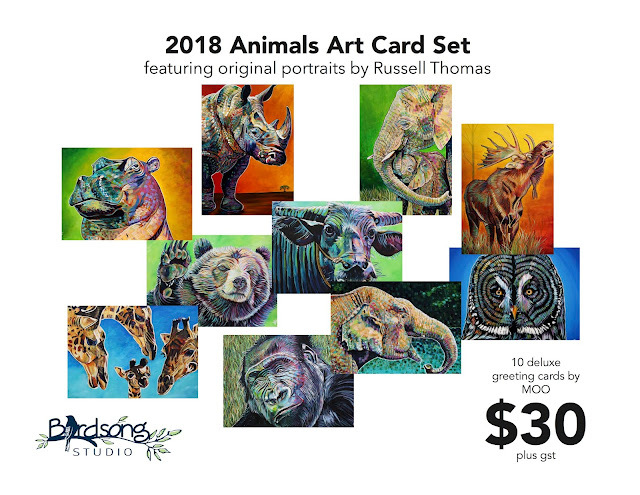 Working on a painting for 6 hours offers a perfect opportunity for immersion into Wide Cut Country, Classic Examples, A Time For Jazz and an array of programs that offer diversity, insight, and a great soundtrack for creative pursuits. CKUA was a perfect friend this weekend as Adam Levine and Stevie Ray Vaughan went from a few lines on canvases to full blown, colourful, and explosive portraits. 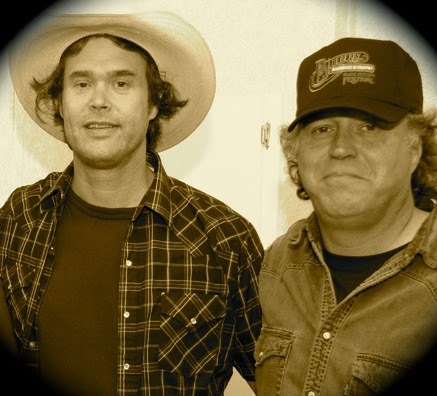 I loved listening to an interview from the vaults with Peter North and Corb Lund last night. The free and easy conversation, the nuggets of narrative, interesting factoids and music were delightful. I didn't realize until the very end that it wasn't live. It didn't matter though; I thought it was wonderful. As I sketched out my next portrait from my growing list of requests, I reflected on how peaceful and inspired I felt. 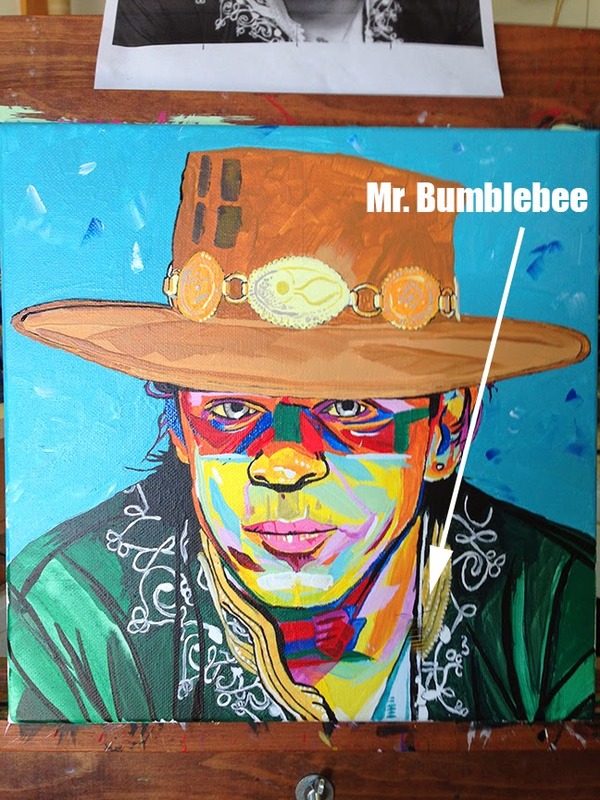 Despite the odd mosquito bite and visits from friendly bumblebees - one of which came for an extended appreciation of the Stevie Ray Vaughan painting (shown above) - I have found incredible joy sitting out in my messy shop, surrounded by paint cans and repurposed yogurt containers, accompanied by CKUA. I'll continue being a supporter, as I once again am connected to its value, to me, our province and the world. It truly is a world of difference.